It is a new generation of intelligent electronic products,with a safe and reliable, fast charging function, a variety of devices at the same time charging,LCD screen displays from charging current of the device to the voltage of the car battery,automatic protection of charging equipment and car port protection. For 12V-24V interface in any car, its maximum power of 24W, maximum output current of 5V / 2.4A, It is not quick charge 3.0 car charger, but it's charging faster than normal. you can recharge your device battery in the shortest possible time, and when you are in the car, you do not have to worry that your device is no battery power and can not work. Its shell made of flame-retardant insulation material, when it in work the surface not heat, the surface of stainless steel bar is beautiful, inside the circuit board all use the highest quality electronic accessories,it with over-current protection, anti-overheating automatically turn off the charging function,more secure and reliable,so you drive the car more secure. It with high performance, can charge three devices at the same time,Micro USB retractable cable can be compatible with Samsung Galaxy, HTC,Huawei,Motorola, Nokia, LG, Sony, PS4,MP3,MP4, Xbox, PS Vita, GoPro,GPS devices, portable chargers, Bluetooth speakers, headphones,wireless keyboards, e-readers, cameras &camcorders,dual USB ports compatible iPhone mobile, iPads; iPods and more. Note: iPhone and Type C port devices do not buy it, we have iPhone and Type C version, please go to the shop to buy your own iPhone or Type C version.When you receive our products, find any questions please contact our after-sales team, we will solve the problem for you in the shortest possible time. 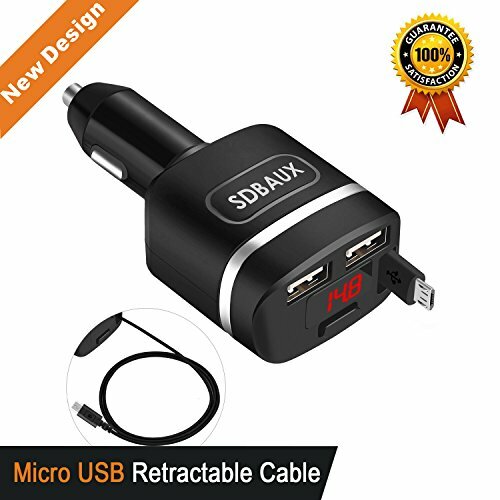 【Universal Compatibility】 -- Car charger with Micro USB 2.8 ft retractable cable for Android system devices, Samsung Galaxy Tab,Tab2, Tab3,Tab4, Samsung S2, S3, S3 Mini,S4/5/6 galaxy3/4/5, Amazon Kindle, Kindle Fire, HD, HDX, Nook, LG,Google Nexus 4, 5, 7, 10, Nokia,Sony,Moto,Huawei,MP3,MP4,PS4, Xbox, PS Vita, GoPro GPS devices, portable chargers, bluetooth speakers,headphones, wireless keyboards, e-readers, cameras & camcorders,and many tablet and mobile devices. 【Safety and Reliability】 - The SDB-1617CA-2U-M quick car charger is made of flame-retardant insulation material. The surface does not generate heat during charging. The highest quality electronic components are used in the circuit board. The car charger has flow protection function, prevent overheating automatically shut off the charging function, Volt meter car battery monitor with LCD Voltage & Amps display, more secure and reliable, allowing you to drive more worry-free. 【Charging Technology】 -- Its charging technology is based on Qualcomm technology and is applicable to any 12V-24V interface of any car. Its maximum power is 4.8A 24W, and the maximum output current of Micro USB retractable charging cable is 5V / 2A. The maximum output current of the 2 smart USB ports is 5V / 2.4A. Although they are not quick charge 3.0 car charger, they are charging much faster than other chargers. Your phones charging can reach 30-40%within 30 minutes. 【Retractable Cable Function】 -- SDB-1617CA-2U-M cigarette lighter car charger has a sleek appearance, small size and light weight. You can carry it in your pocket at any time and use it in car. With Micro USB retractable charging cable, eliminating the need to purchase extra USB charging cable, afterusing the retractable charging cable, you can automatically rewind to the original position with the manual button. It will not tangled together, making your car more space and more neat. 【Quality and Service】 -- Our car charger has the most advanced automated manufacturing process. Every product has to undergo a rigorous inspection. the charging connector has been tested than 5,000+ time, high temperature testing and high frequency vibration testing.With 12 months warranty commitment, 100% risk-free procurement. If you have any questions about this product by SDBAUX, contact us by completing and submitting the form below. If you are looking for a specif part number, please include it with your message.